We're doing it bigger, better and in a special venue! 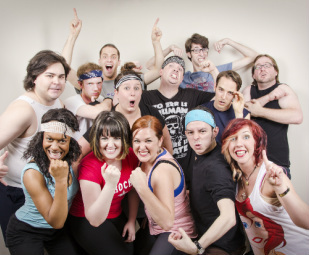 The biggest improv marathon in the south is BACK. Join a great Nashville tradition on Saturday Oct 19th. 13 hours of non-stop improv with all proceeds being donated to Hands On Nashville. Individual tickets are on sale for the same price as a regular show. $10 for 2 hours. Shows feature the best of fan-favorite games, music and longform, and no game or style will be repeated. We can't wait to push ourselves to the limit for your enjoyment so buy your wristbands or tickets today! click here to read more about HON! On Sale at the Door! On Sale at the Door! On Sale at the Door! On Sale at the Door! On Sale at the Door! On Sale at the Door! On Sale at the Door! What is improv & what should I expect? We begin with audience suggestions, so the shows are entirely improvised and different every time. No show or game will be repeated so you can stay for the entire time and be constantly surprised. Tickets are only $10 and include all applicable sales tax. We rate our shows PG-13, and we always remind our players if there are children in the theater. So it is family friendly. During the marathon all shows after 11pm will considered late night and the rating will be lifted. Hands On Nashville is an improvisational charity. They take suggestions from their audience, and create magic through community cooperation. They find problems in Middle Tennessee, and send a volunteer squad out to fix them. River Flooding? HON is there. Need a Wheelchair Ramp? HON is on the case. School in need of repair? HON, right there. That’s the real power of Yes, And.